See pictures from last week's (4-8 December) fam trip to Marrakech, which was attended by representatives from UK agencies including Zibrant Live, Ashfield Meetings & Events and In2Events. 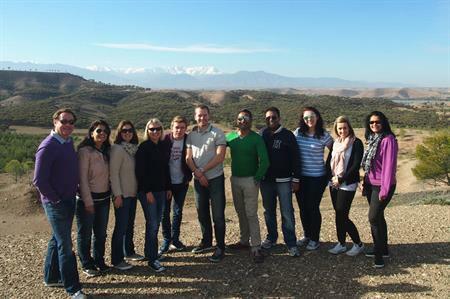 C&IT joined a host of UK agencies on a fam trip to Marrakech, which was organised by Pearl Representation in partnership with DMC Morocco Unlimited and Beachcomber Hotels with flights supplied by Royal Air Maroc, to explore the popular North African destination. The itinerary included an intimate tour of the Medina, with a visit to the oldest Quranic School in the city, as well as an entire day exploring the culture and traditions within the great Atlas Mountains. The group’s adventurous side was put to the test as well with an array of activities from quad biking to zip-lining across vast canyons and even a spot of camel riding. On the first night, the group stayed at the Les Jardines De La Medina hotel, situated in the historic old town of the city, before moving to the six-star Royal Palm Marrakech for three nights.